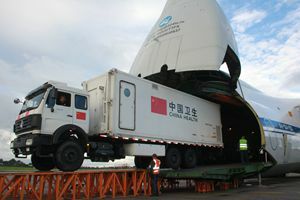 On 25 September, 2014, a China-chartered airplane carrying a China-aided mobile bio-safety level Ⅲ laboratory arrived at Lungi International Airport of Sierra Leone. Chinese Ambassador Zhao Yanbo, Acting Minister of Foreign Affairs and International Cooperation Dr. Ebun Strasser-King, Deputy Minister of Health and Sanitation Mr. Foday Sawi, Deputy Minister of Transport and Aviation Mr. Ibrahim Mansaray and other senior Sierra Leonean officials attended the arrival ceremony held at the airport. Sierra Leone Broadcasting Corporation (SLBC), and other media organizations covered the event. Ambassador Zhao stated that Chinese President Xi Jinping is very much concerned about the Ebola situation and cares for the friends in Ebola-stricken countries. President Xi announced on 18 September during his visit to India that China will provide a further 200 million Yuan (equally 32.54 million USD) package of cash, food, material aid to Sierra Leone, Libria, Guinea and its neighbouring countries to help contain Ebola. Ambassador Zhao indicated that taking into consideration of the Ebola situation in Sierra Leone and in response to the urgent need of labs in the country, China decided to provide a mobile bio-safety level Ⅲ laboratory to Sierra Leone. China’s laboratory will scale up the testing of Ebola cases and help Sierra Leone control Ebola at an earlier date. Acting Foreign Minister Strasser-King expressed her deep appreciation to the Chinese government and people for always standing with Sierra Leone when Sierra Leone is in difficulty, and commended that China has played a crucial role in helping Sierra Leone contain Ebola. She said that the three-day national lockdown from 19 to 21 September resulted in a large number of survivors waiting to be tested, and indicated that China’s mobile laboratory will speed up the detection process to help Sierra Leone cut off the transmission chain of Ebola. 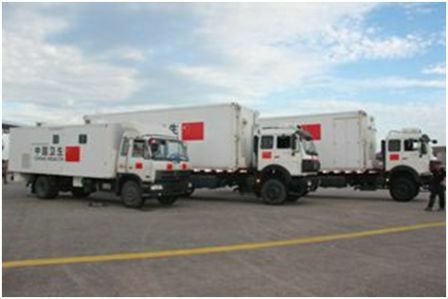 Deputy Health Minister Sawi and Deputy Transport Minister Mansaray indicated that the mobile lab provided by China will help Sierra Leone collect Ebola data more timely and effectively, and greatly improve Sierra Leone’s capacity to face Ebola challenges.